Who can predict what wonderful things can emerge from the meeting minds of an artist and a scientist? Prof. Stefan Hutzler; leader of the Foams and Complex Systems Group, School of Physics, Trinity College Dublin? Which began in 2014 when I sent Stefan a portfolio of bubble photographs for comment - a research requirement for my BA (Hons) Photography course. Stefan invited me to Dublin and a plan to work together was established. I became the Group's Visiting Research Assistant, initially for a 2 year stint, but now due to its success, is continual today. We were very excited and surprised by one particular outcome of our collaboration... my 'Bubble Chains' discovery. 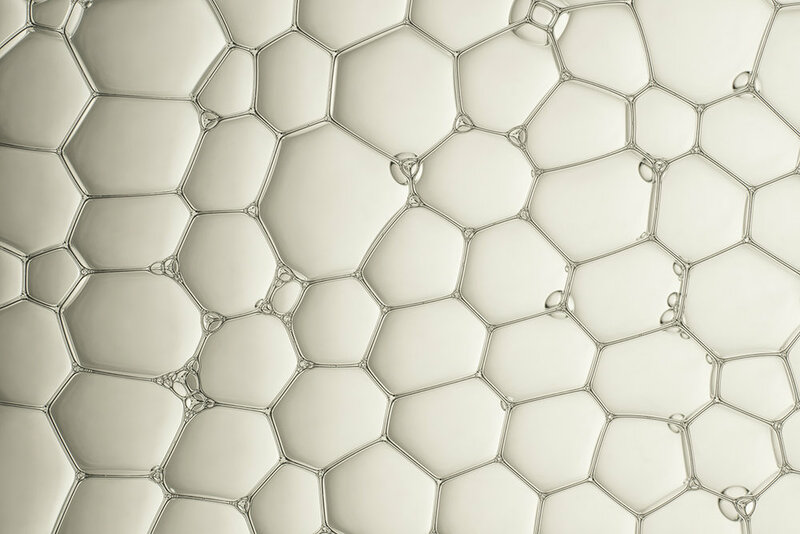 Each structure is always composed of equally sized bubbles. 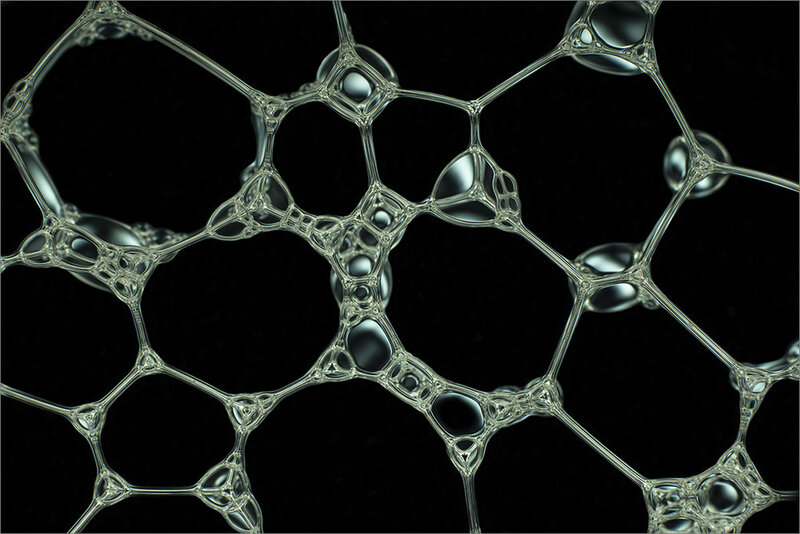 A variation in structure occurs when bubble size and cylinder diameter is increased or decreased. 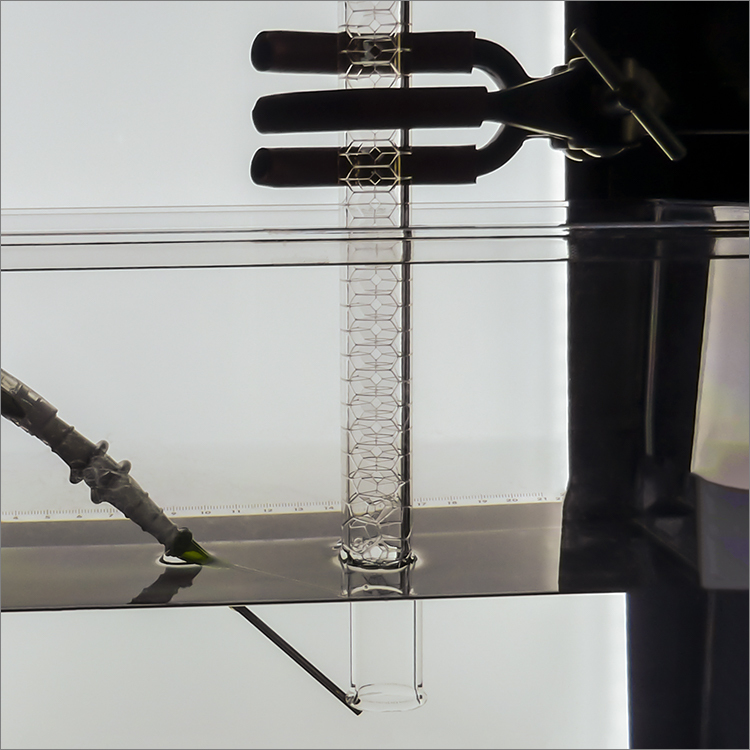 A length of plastic tubing is attached to an aquarium air pump. 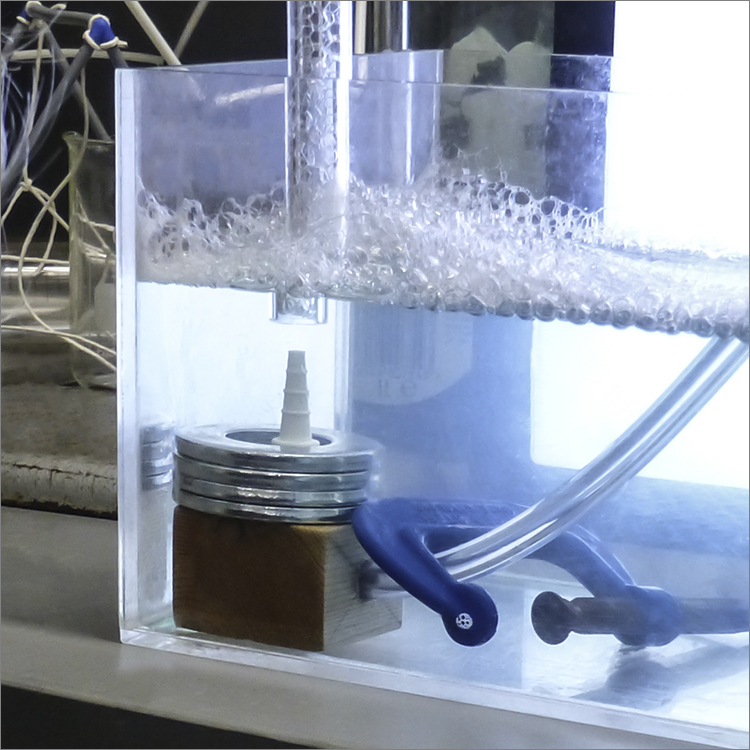 The lower part of the cylinder is placed into a bath of water with a little washing up liquid added. 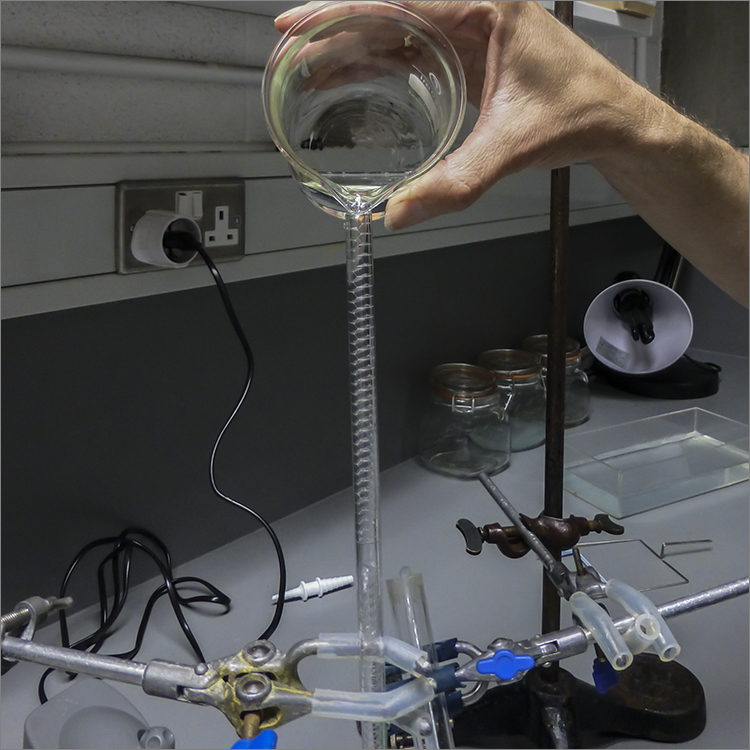 A steady stream of bubbles enter the cylinder from below. Each new addition pushes the structure inside the cylinder upwards. Crystallisation takes place when their liquid composition drains under gravity. 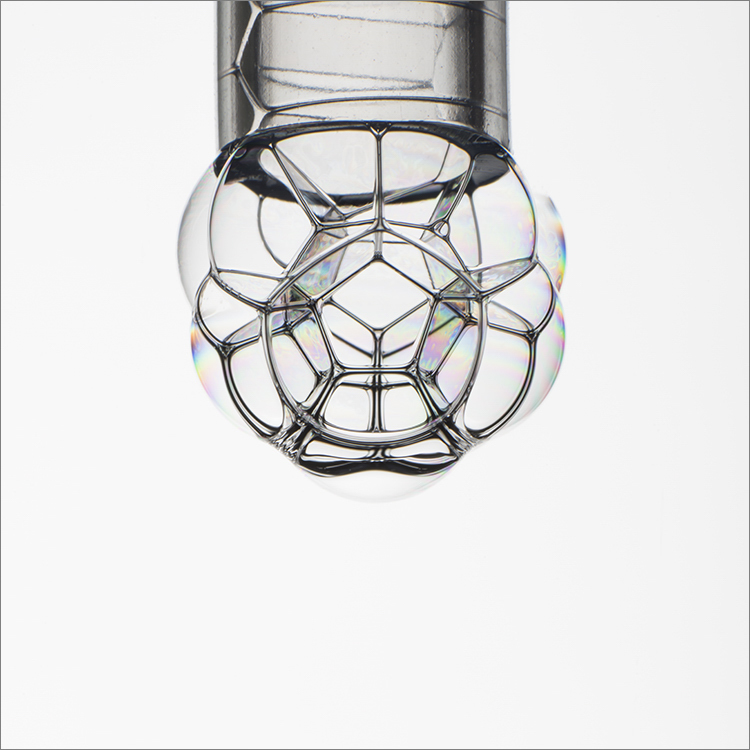 As a result, bubbles lose their round, plumpness and turn into straight-sided polyhedra to form an ordered cylindrical structure. 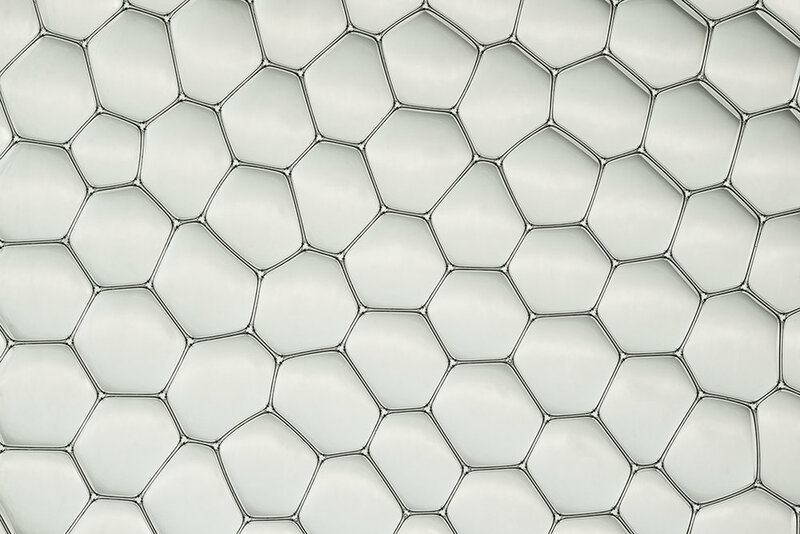 Bubble wall thickness reduces over time, eventually becoming barely visible. 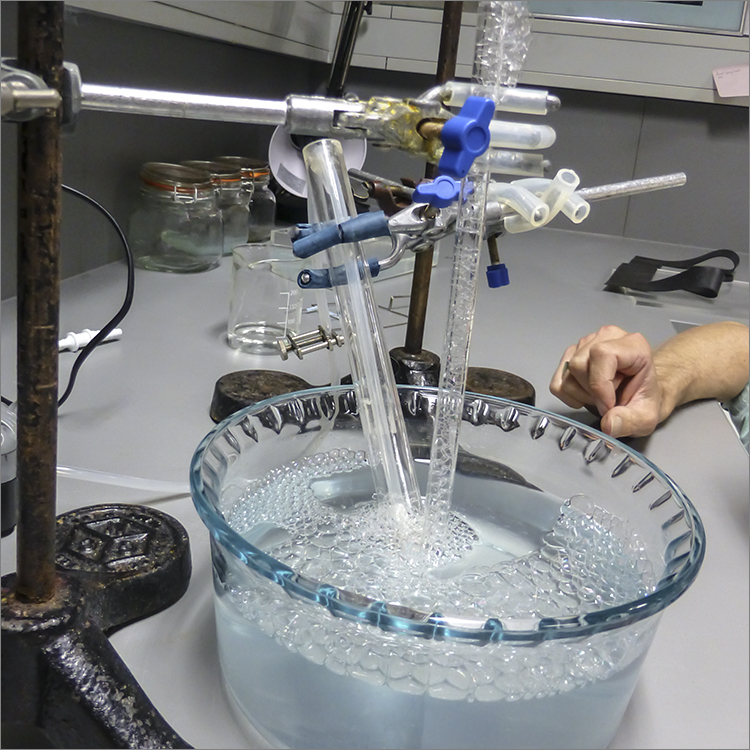 This process can be reversed by gently adding a small amount of bubble solution to the top of the cylinder, whereby the draining process begins once again. Creating a structure is not an exact science, the trick is to create exactly the same conditions, and this is hard. Foams are not only appealing due to the elegant structures they display and which is showcased in many of Kym's photographs. To the scientist they also offer a variety of intriguing problems. How can foam structure be described mathematically ? How can one deal with the apparent randomness? What are the underlying physical principles? How does the structure determine the physical properties of foam? Think of shaving foam. Consisting of gas and liquid it nevertheless doesn't flow, but when left on its own displays rigidity and stands upright. Think of Guinness foam. Why is it creamy white when the beer it consists of is so dark? And how does that pint settle? The Foams and Complex Systems Group, led by Prof. Stefan Hutzler, explores all of the above aspects by means of experiment, theory and computation. The group has been at the forefront of research into the physics of foams since the 1980s when Prof. Denis Weaire established foam physics at Trinity College Dublin. In our recent collaboration with Kym we aim to explore foams that are not generally found in nature. 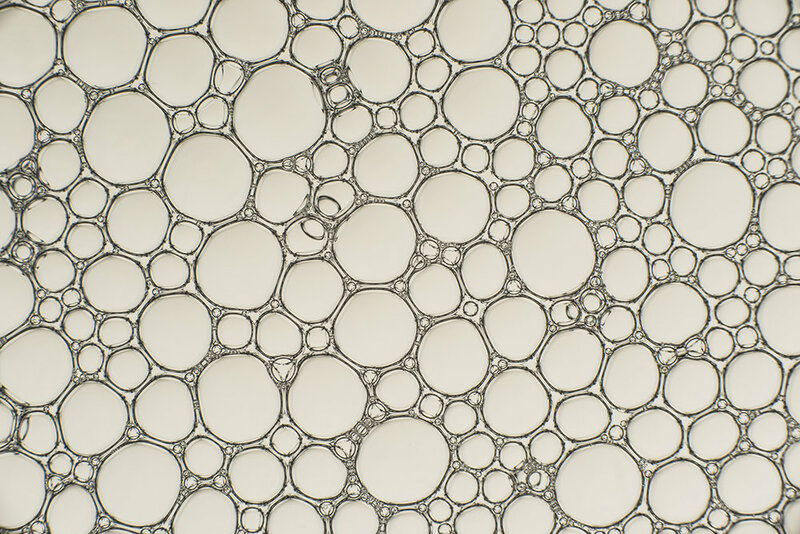 We experiment with foams where all the bubbles are identical in size. 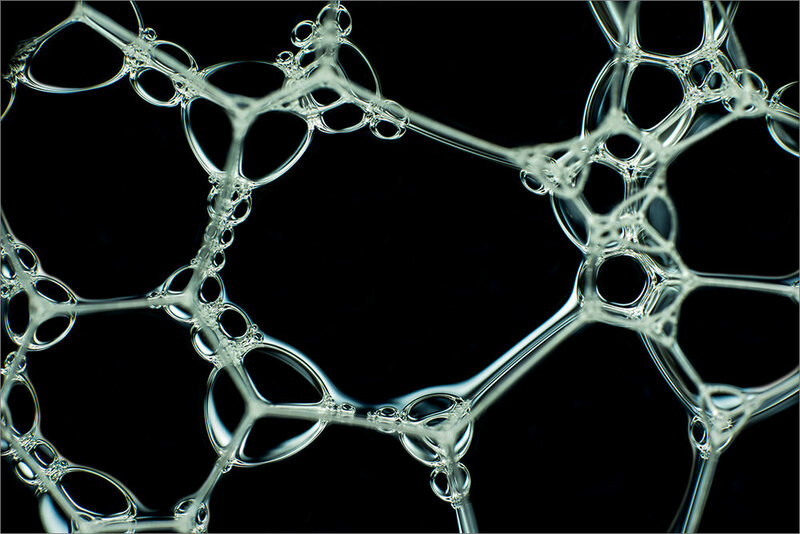 This may result in spontaneous crystallization where the bubbles arrange into ordered structures, very unlike the random mess one generally associates with a foam. 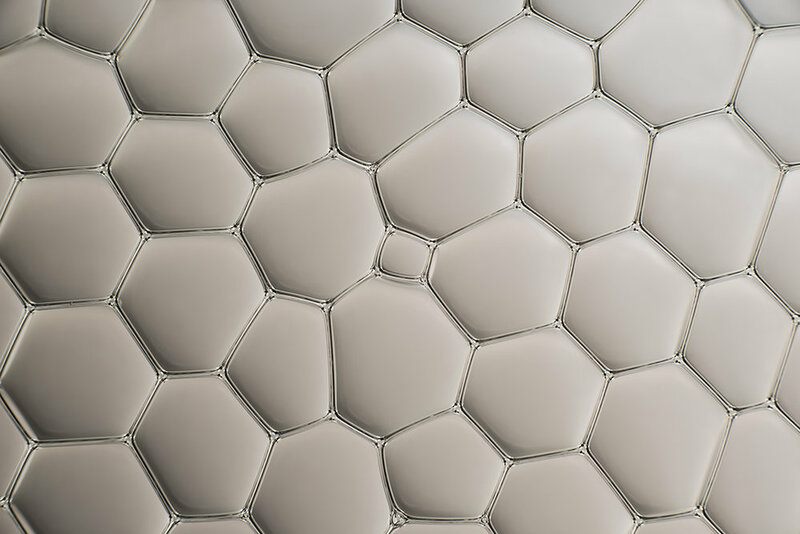 Our collaboration not only helps to visualize the aesthetics of such structures, but due to Kym's methodical approach we are already beginning to identify new scientific avenues which we are keen to explore. 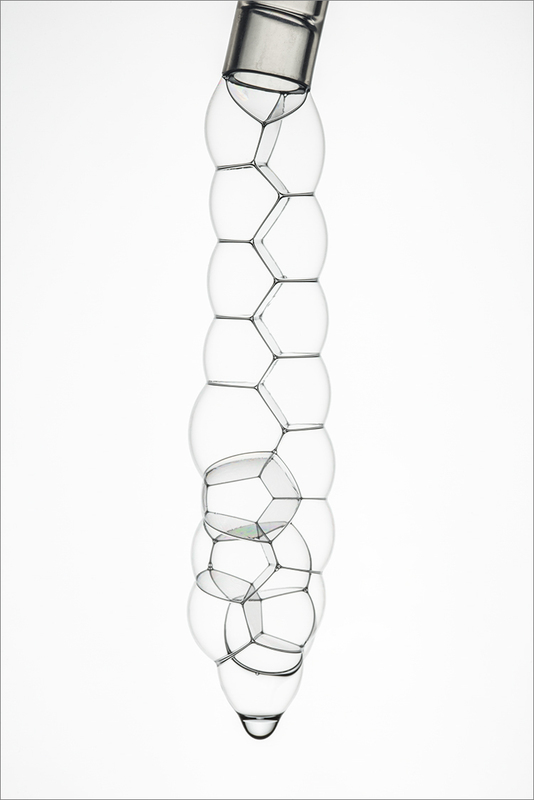 Ordered cylindrical structures certainly challenge visual perception because we're not familiar with seeing bubbles as regular, straight-sided polyhedra in glass tubes. From a photographer's point of view, producing images that make sense and overcome photographic hurdles requires patience, and plenty of it. 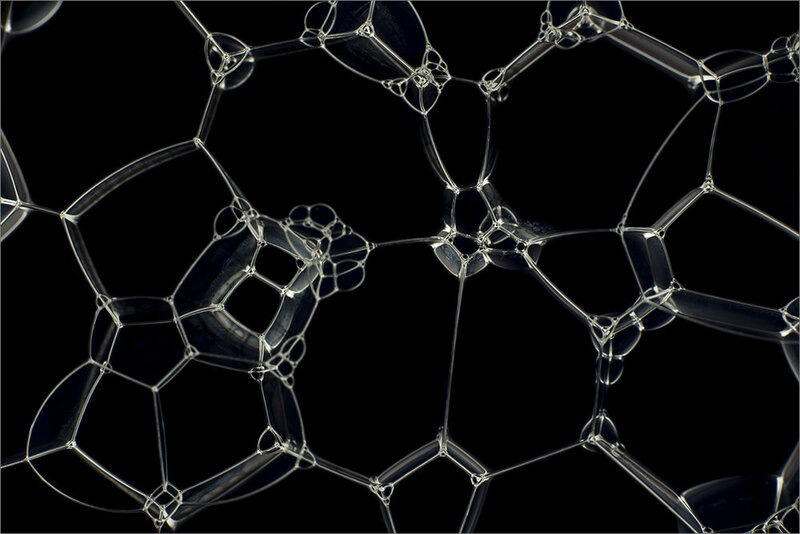 In the first instance, creating a structure isn't an exact science, the bubbles may or may not self-organise. The trick is to create exactly the same conditions, and this is hard. 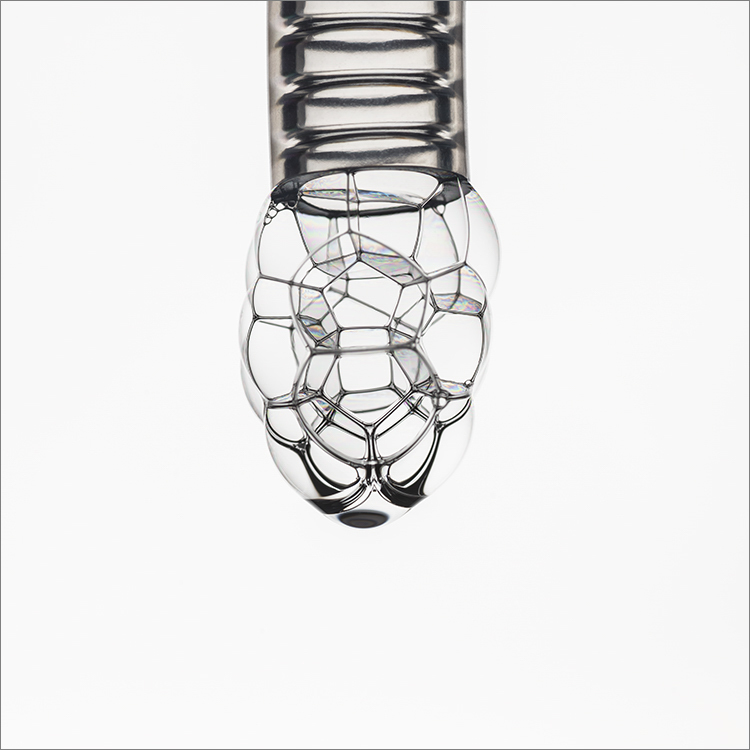 Bubbles in the tube are pushed upwards by the continual addition of bubbles from below. 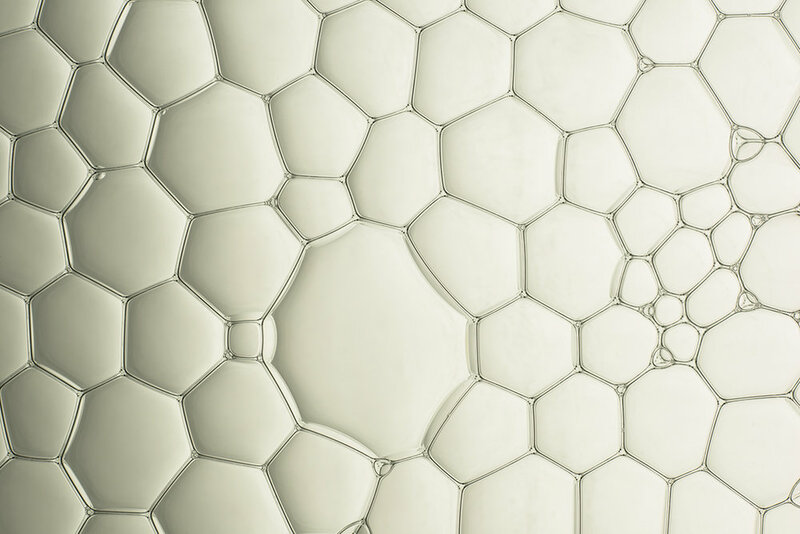 At the same time, the bubble walls become continually thinner due to their liquid draining. Wall thickness affects the amount and direction of travelling light. Every bubble will undergo a cycle of light interference colours and patterning during its lifetime. Each colour is dependent on wall thickness, as the wall drains so the colours change. A colour's brightness, intensity, saturation continually changes throughout the draining process. There comes a point when the bubble wall becomes too thin to refract light - referred to as a Newton black film, this is a good indication the bubble is about to burst. 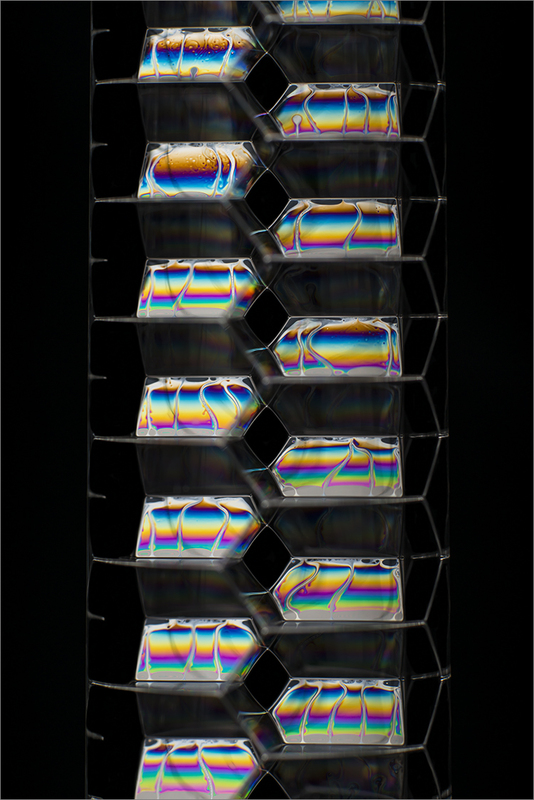 Light interference colours and patterns are made more visible by directing the light source parallel to straight-sided bubble walls and placing the cylinder against a dark, preferably black, background. But, the walls of each structure don't always fall at the same angle, lighting a structure in it's entirety to show the cycle is impossible. On the plus side, particular points of scientific interest can shown by selective lighting. Watching the cycle and wonderful spectrum of colour and patterns is mesmerising and a sight to behold. Bubbles and glass are extremely light sensitive. 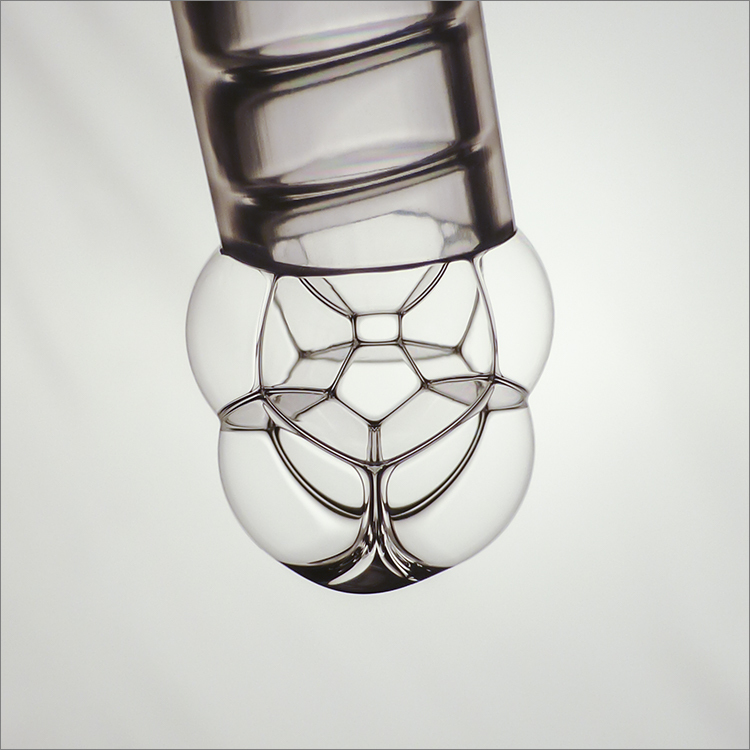 Shadows and reflections appear throughout the draining process in and outside the cylinder and on the bubbles themselves. Ordered cylindrical structures illustrate many fascinating, physical properties of bubbles and accompanying fluid dynamics. In the lab we can look at a structure from all angles. 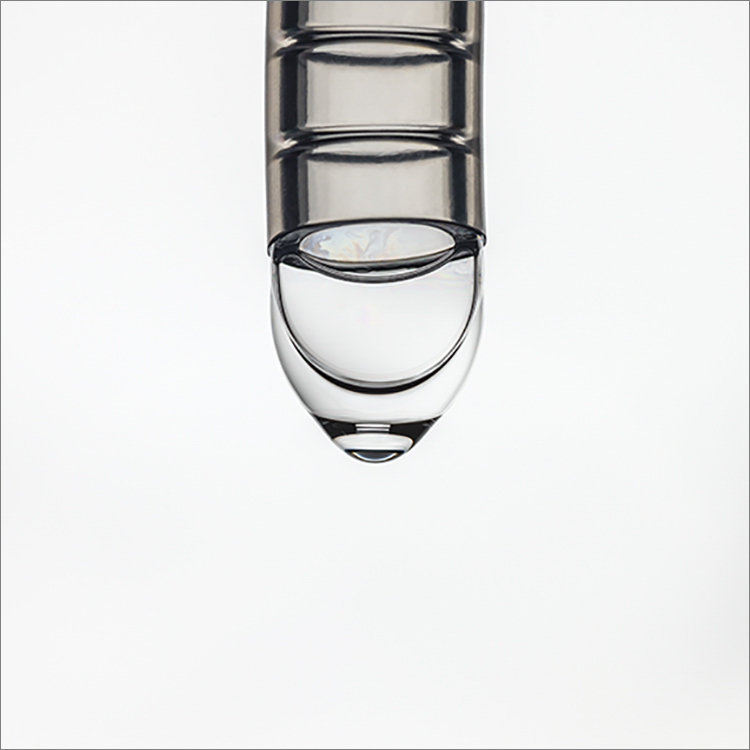 For photographing, the cylinder is gently repositioned. However, this can have a profound effect on composition and make the structure appear off sync. So, the questions arise; what is the optimal position of the cylinder, at what stage of the draining process do you take the photograph and how much of the structure must be shown in an image for publication? Artistic and photographic freedom is the great benefit of being an Independent. Kym self-funded her collaboration that, in part, gave her the freedom to explore new lines of enquiry without constraint. 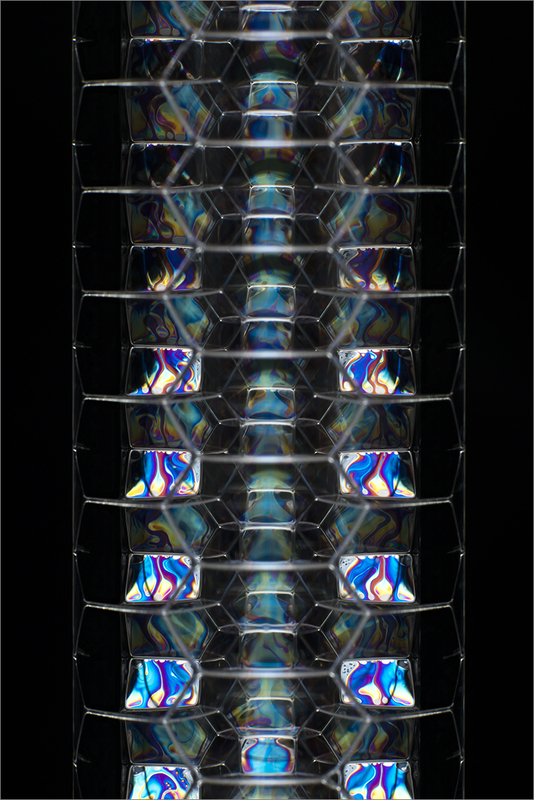 For example, her photographs of ordered cylindrical structures showing light interference colours and patterns. Independence without constraint led to Kym's exciting new discovery for scientific research - Bubble Chains. 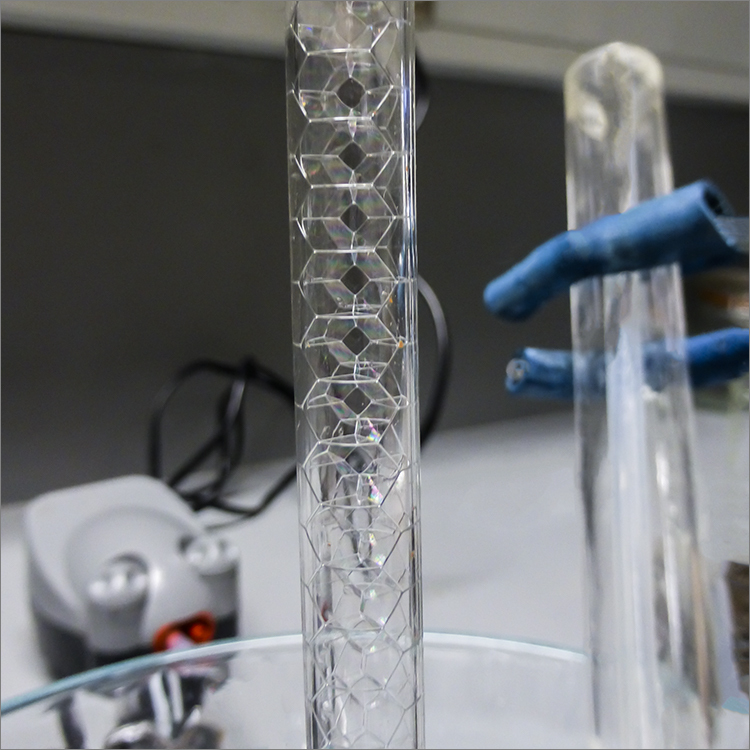 To ocs she put a funnel in the top of the cylinder to contain exiting bubbles, and wondered if these bubbles would continue to self-organise into the same structure if the funnel was removed. Obviously, the bubbles would spew out and down the glass cylinder. So, she replaced the cylinder with a length of plastic tubing. After making a few alterations to the rig, the bubbles finally began to self-organise as she'd hoped. Stefan was astounded and excited when he saw an the initial video clips. "I didn't believe it until I saw it, now we're going to simulate this." To continue the story click 'Studio 1' and follow on. Accompanying text pops up when your cursor hovers over the lower edge of each image. For ease of comprehension the air supply comes through a 'pipe' and the structures form in a 'tube'. Essentially they are both the same, albeit with differing diameters. 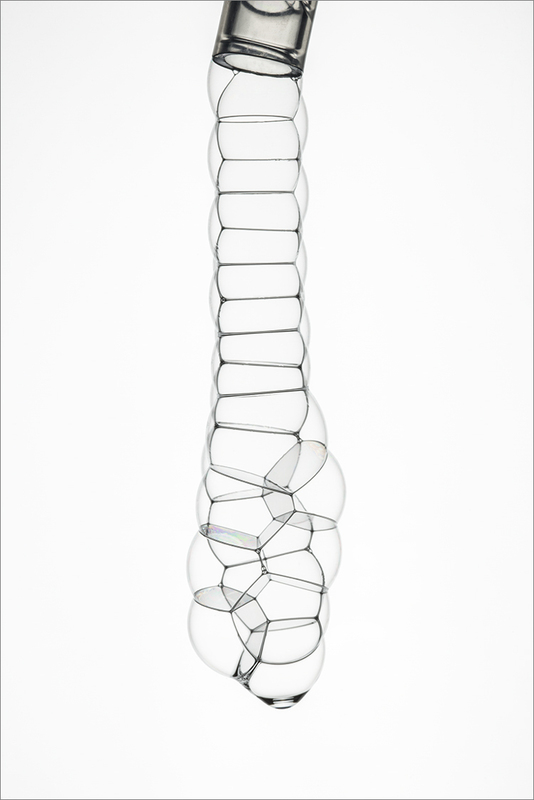 Watch bubbles organise themselves into an ordered chain in this 3 min video here. "She described a structure to me , and I didn't understand what she meant until she showed me the photograph", he says. 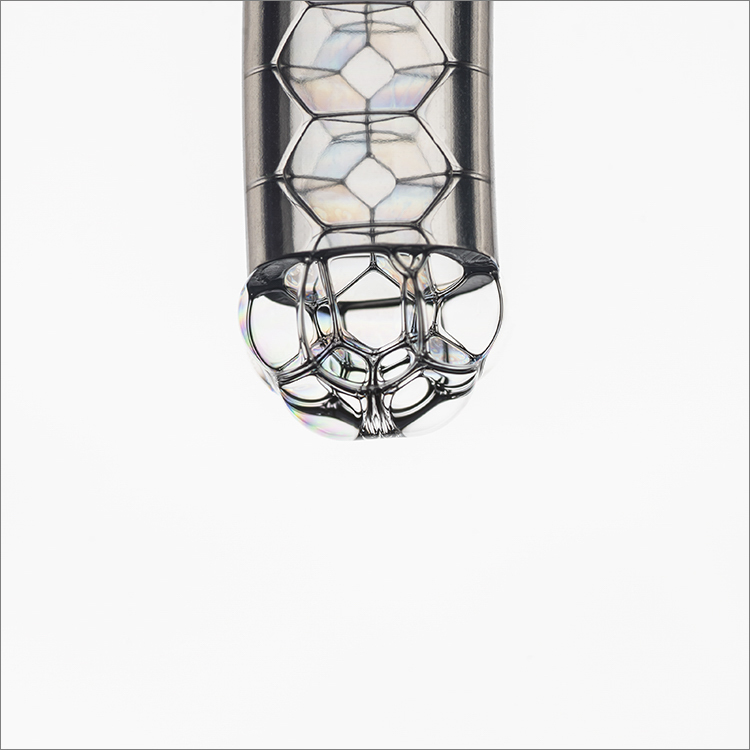 Cox had taken away the cylinder that was confining the bubbles and simply allowed them to dangle out, creating a new structure. "These were structures that we never, ever thought about, and now we've started simulating some of these on the computer. So there, the artist brought something into the science area", he enthuses. "So that was a nice example of something new coming out of the collaboration because we would never have done that before." 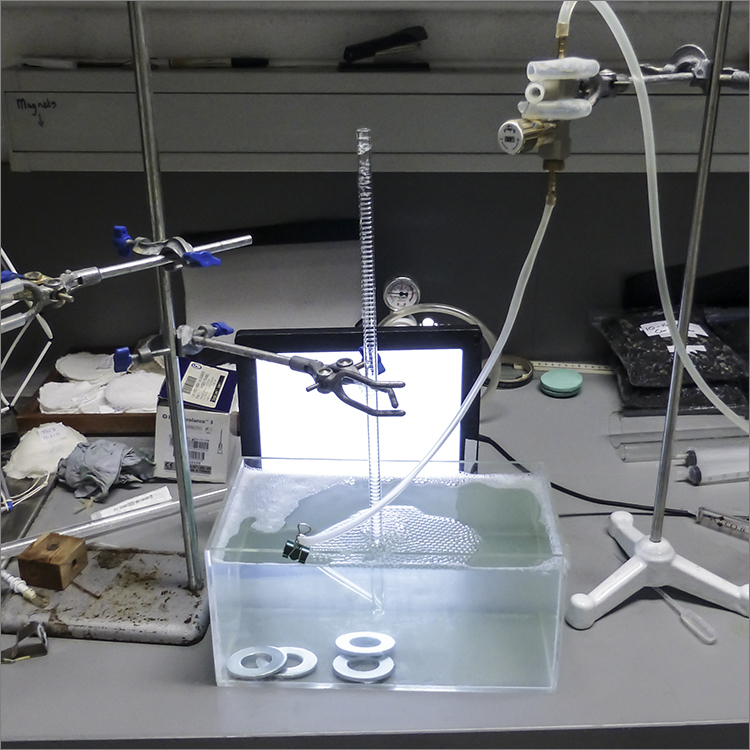 This collaboration pushed Hutzler to consider another side of his research and opened new pathways for his work: "If you do something all the time you just tend to think of your routine, so I never would have thought to get rid of the tube." 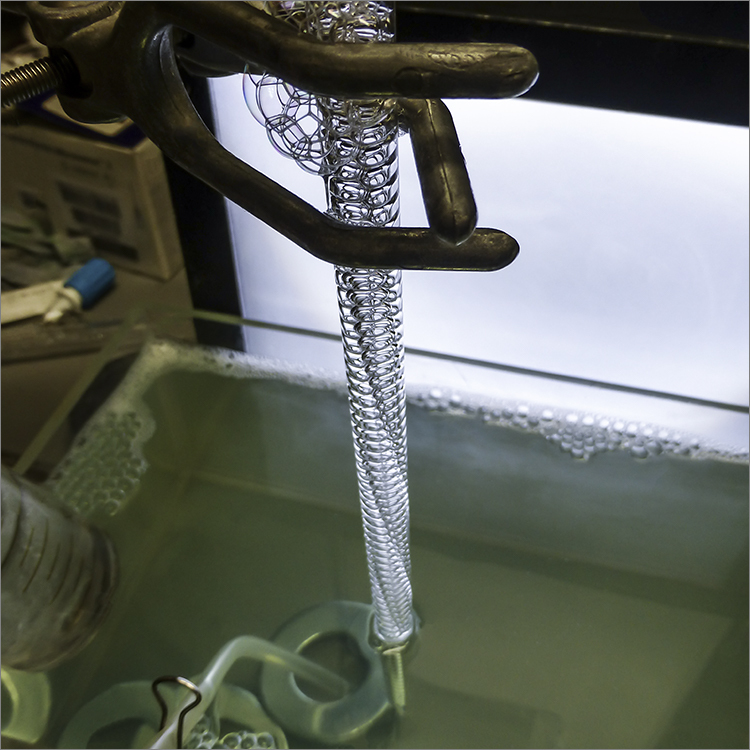 Kym's first ordered bubble chain was discovered in February 2016. A small selection of subsequent chains was then exhibited at the 11th EUFOAM Conference, 3-6 July 2016, Trinity College Dublin. The biannual conference is dedicated to foams and their applications, attended by researchers from Europe and overseas. 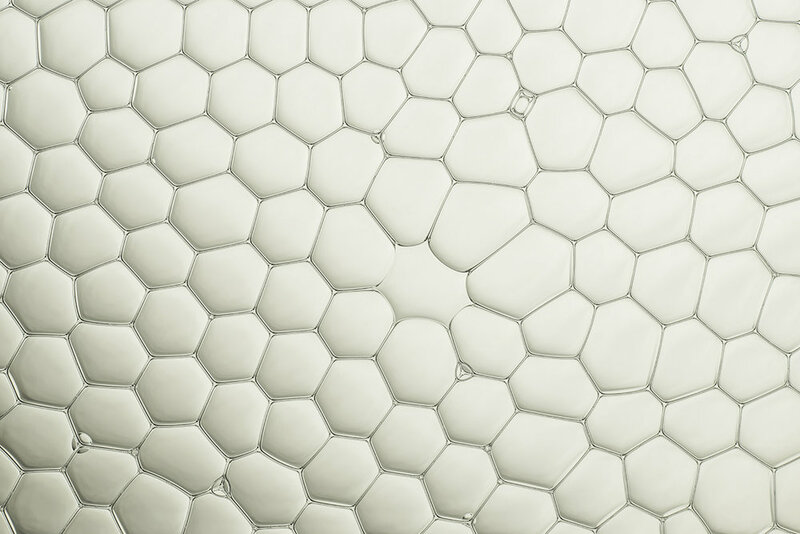 Columnar ordered packings of spheres have been the subject of scientific investigations for several decades because they relate to all length scales ranging from molecules packed inside nanotubes, seeds around a stem to bubbles inside tubes. These sorts of packings usually require some kind of cylindrical confinement, for example a tube. Kym's bubble chains and my simulations illustrate that this is not necessarily the case. 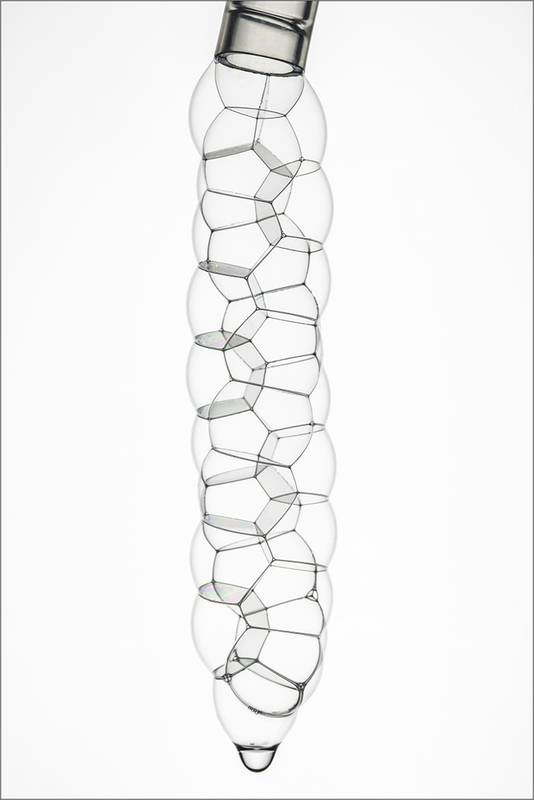 When my supervisor Prof. Stefan Hutzler first introduced me to her bubble chains we were puzzled by the reason for their stability. 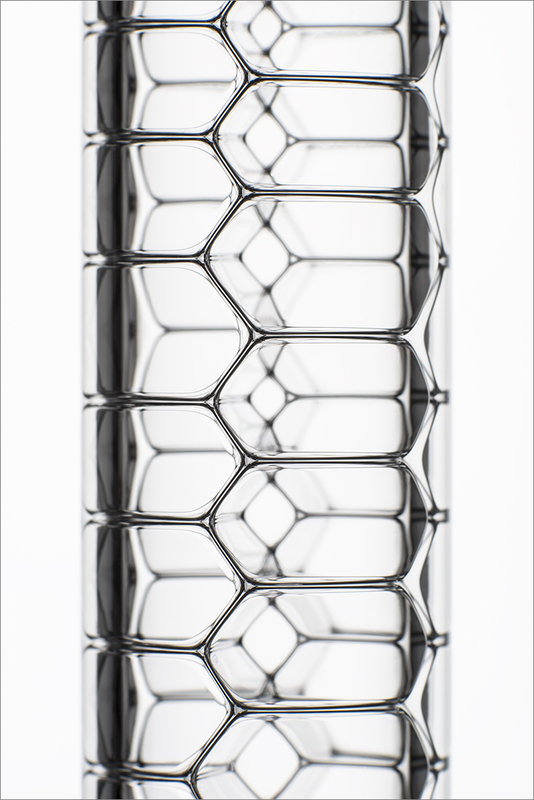 How can those complicated chain structures be stable without confinement? Thus we decided to investigate using my favourite tool in scientific research: Computer Simulations. I ran simulations for the bubble chains with Surface Evolver, this program simulates liquid surfaces based on minimal surfaces. 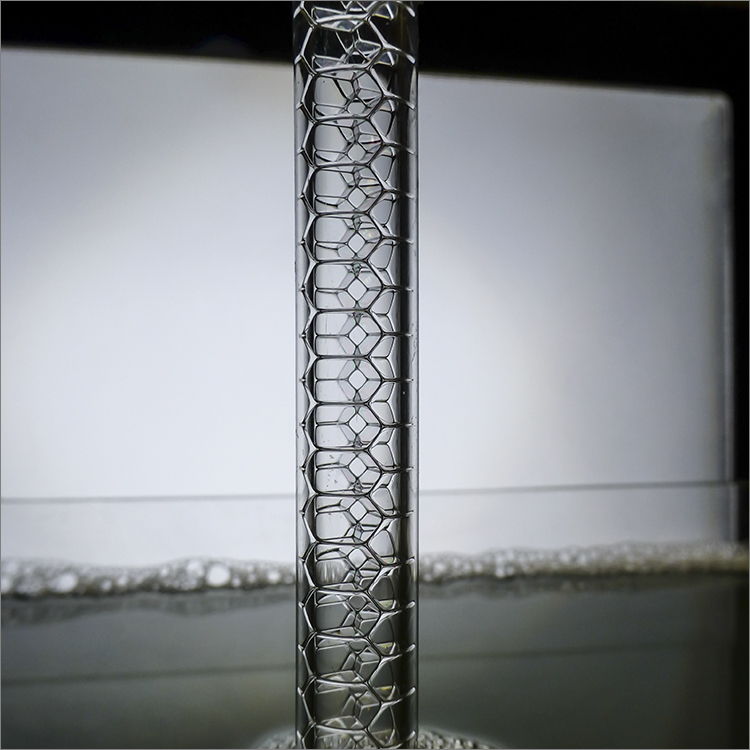 The results showed us that these structures were indeed a consequence of minimal surfaces under gravity, which preserved the cylindrical symmetry. 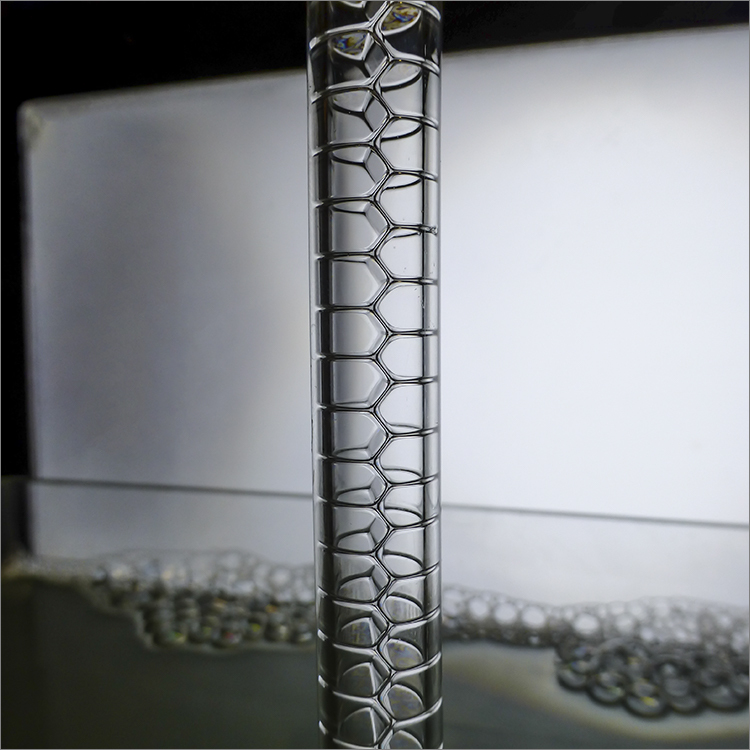 Since bubbles have always acted as a good toy model for systems in other material sciences, we might see these chains again in the nanosciences in the form of columnar chains of molecules. 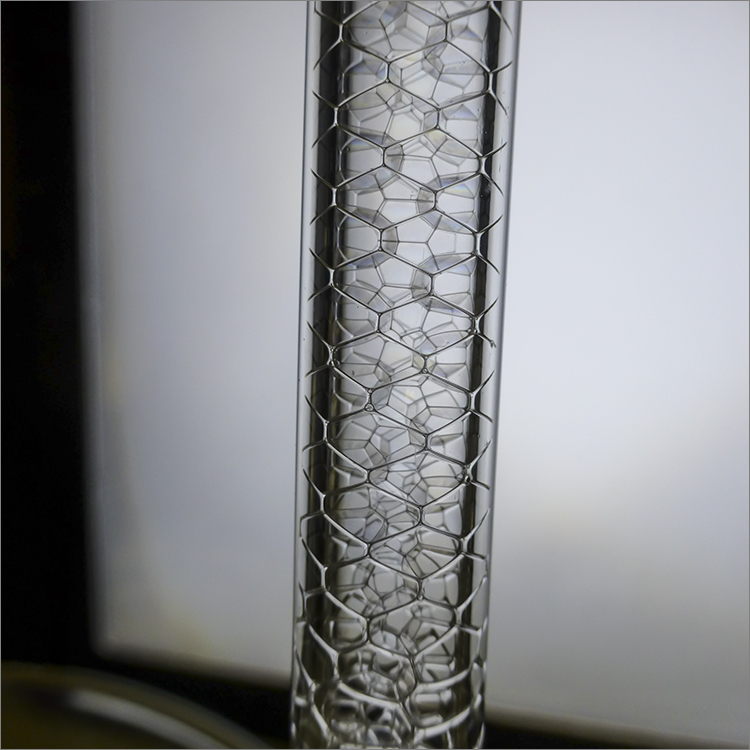 Tube-shaped molecules are of paramount importance in liquid displays, which make up computer and phone screens. It may be, at some point in the future, my computer simulations and Kym's bubble chains will increase the visual experience of displays, monitors and screens! 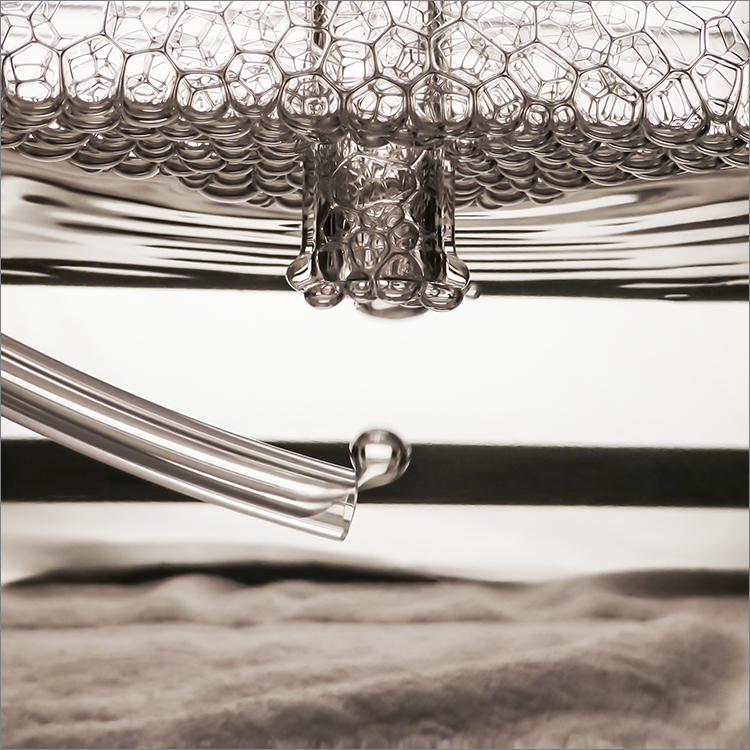 Kym's art 'Nestings' are inspired by artist David Medalla's 1960s kinetic sculptures, Cloud Canyons. The narrative of Nestings represents the appeal of unexpected outcomes. Created using the same methodology as Bubble Chains, this series demonstrates an awareness for negative assumption and to embrace the consequence. Watching bubbles do what they do is an enjoyable and important part of Kym's work. For each new project, she deconstructs the anticipated outcome to its simplest elements and progresses from there. 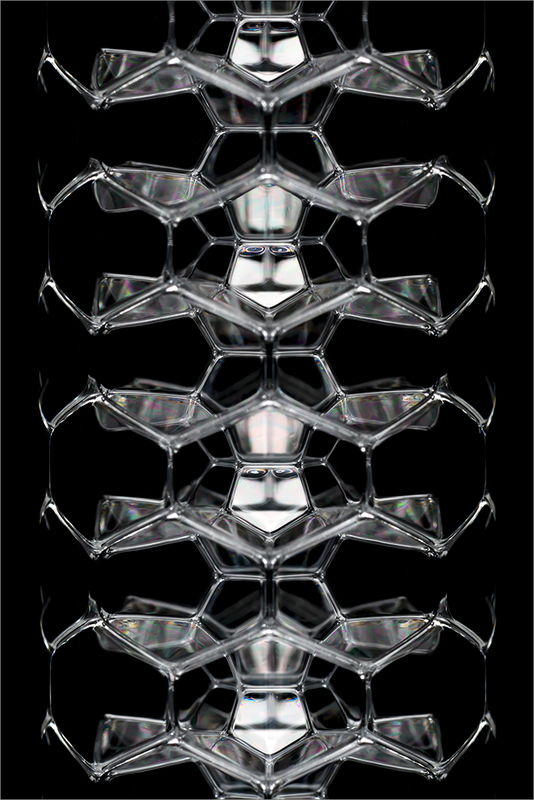 During the early stages of their collaboration this approach benefitted her comprehension of Stefan's work with bubbles and how they sit together and crystallise in a confined space. Foamings is her starting point. 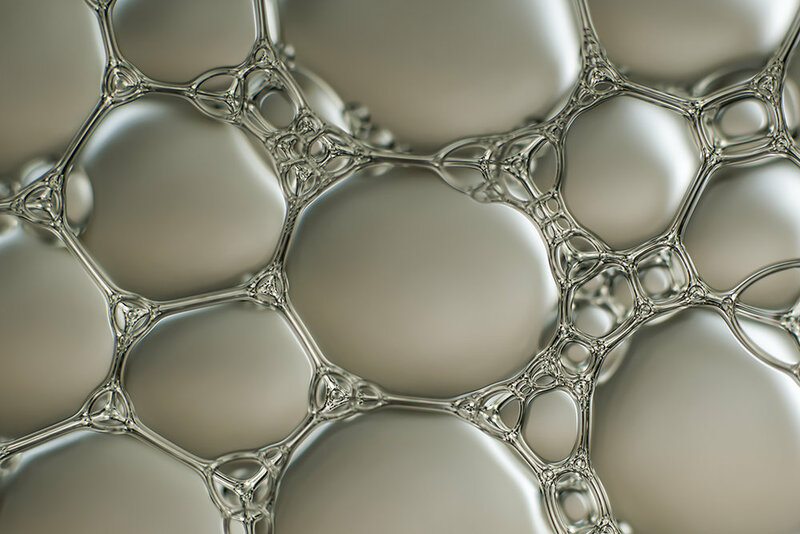 The series shows a layer of bubbles sitting on top of a bath of water with a little washing up liquid added. The bubbles are made by an aquarium air pump. Kym would like to thank the members of the Foams and Complex System Group for giving the following photographs a title. Art and science work in quite different ways: agreed. But, bad as it may sound, I have to admit that I cannot get along as an artist without the use of one or two sciences. ... In my view, the great and complicated things that go on in the World cannot be adequately recognised by people who do not use every possible aid to understanding. 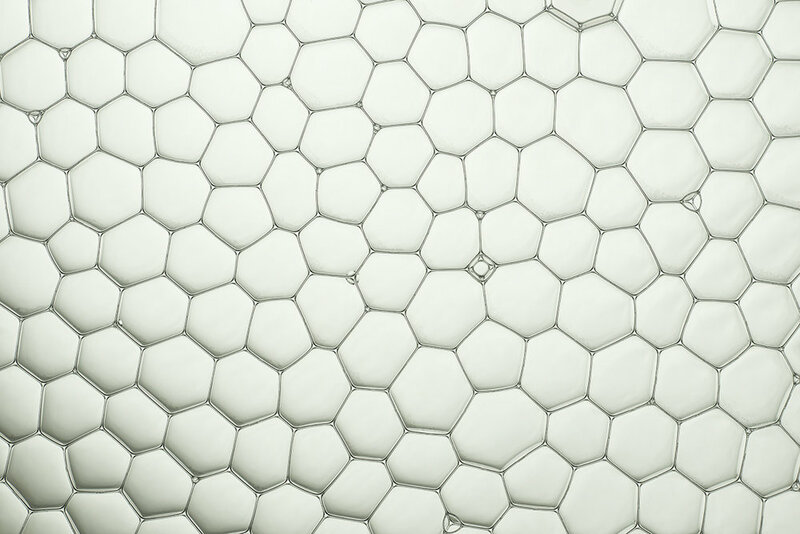 Maybe it's because Kym is a former Fingerprint Expert that she gets a real buzz from looking at and working with bubble structures, patterns and their associated characteristics. Knowledge and experience is key to the progression of her work. Artists and scientists develop ideas to push the limits of possibility, each exploring their creative thought processes to come up with something new. By working together, Kym and Stefan exemplify the benefits of an ArtScience collaboration that is not only advantageous for their own work, but is engaging to their professional colleagues and spreads the word to a wider audience beyond. If you would like to collaborate with Kym for your ArtScience project, please do get in touch, she would love to hear from you.